We have seen enough peculiar fashion moments and memes in 2018 for us to roll down laughing and safely say “Go home internet, you are drunk”. Let’s be honest, fashion is not always glitz and glamour. It can be messy, scary and downright hilarious. It seems like memes have joined the fashion party, thanks to the creative director of Gucci, Alessandro Michele. The Italian fashion designer recruited meme-makers last year to assist with his ad campaigns. Gucci debuted it’s collection of watches last year using a collection of images in meme style. 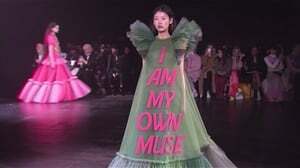 Fashion memes are quickly becoming a thing and we are excited. With 2018 coming to an end, what better time to have a look back at the best fashion moments of the year. And by best we mean funniest. Kanye West’s bizarre tiny slippers he wore with a suit to 2Chainz’ wedding definitely made the cut. The small fitting Yeezy sandals were deemed by some inappropriate for a wedding. As if wearing slides or slippers to a wedding is not thought of as odd enough, he wore them with white socks and sent the internet into a frenzy. 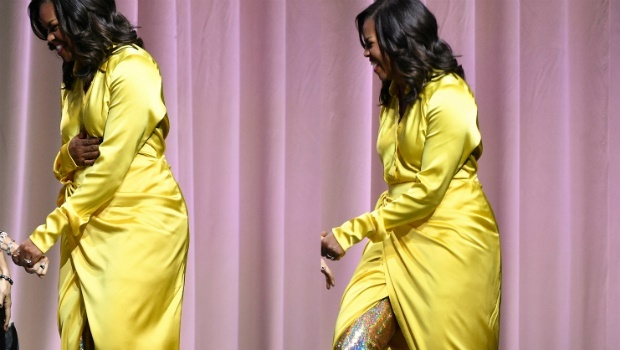 The former First Lady of the U.S. Michelle Obama, found herself an internet meme after she wore $4000 (R 58,202.70) sparkly thigh boots to a media interview. The boots wowed the internet and went viral, and that almost always means ‘incoming meme’. We certainly wouldn’t mind stepping into 2019 in the fancy iridescent boots by Balenciaga. Speaking of boots, the President of the U.S. Donald Trump was also found in meme-ville wearing women’s Off White leather boots worth $476.00 (R6 913. 27). Rihanna wore a papal-esque gown at the 2018 MET Gala that looked like it came straight from the Vatican. Meme-makers gave her a popemobile to complete the look. The highest paid model of 2018 Kendall Jenner did not escape internet meme-makers. The naturally slim reality star is not so slim in a Michelin Man puffer coat. Meghan Markle who is expecting her first child with Prince Harry already has a baby bjorn courtesy of meme-makers. The internet seems to think the Duchess of Sussex will surely need this bjorn by French fashion designer Marine Serre. Bella Hadid is one of the most sought after models. This is New York Marathon vs Bella. Run Bella! Kim Kardashian is a wrestling super star in underwear bottoms and a pair of Yeezy sneakers. READ MORE: Short blond hair is the absolute go to December hairstyle - or is it pink? Cardi B became a Nike meme after her physical altercation with Nicki Minaj left her missing one shoe. The rapper is the king of memes. From awkward vacation snaps to hilarious Jet ski moments, Jay Z the meme is simply funny.